Sidney Slon/Staff Photographer Paul & Sons brings a unique twist to different pizza variations and is located at 67 ½ Leroy St., open from Tuesday to Saturday. For New York natives in search of quality pizza, Paul & Sons offers a slice of home. Paul & Sons, a small pizza shop that opened about a year ago, is operated by chef Paul Myers, a James Beard Foundation Award nominee. He has also worked with celebrity chefs like David Chang and Tom Douglas in Seattle, all James Beard-winning chefs. Before establishing Paul & Sons, Myers and his wife, Carrie Blabac-Myers, owned a fine-dining restaurant in Montana called 515. They moved to Binghamton because it is where his wife grew up and where her family is located. The couple also has two sons, hence the name Paul & Sons. Myers credits much of the success of the shop to his wife. After moving to the east coast, Myers worked as a wine salesman for a number of years, as well as a restaurant consultant. He said his inability to find the perfect niche in a pre-existing restaurant led him to start his own. The shop has a homey feel, with a large “Welcome Binghamton, New York!” poster on the side of its brick wall. There are plenty of seats by the window, one large table in the center and a self-serving water station. The kitchen is in full view behind the cash register, where Myers can be seen stretching dough. A single slice is priced under $5, a 14-inch pie is $15 and an 18-inch pie is $18. The shop also offers the option to create your own pizza — a 14-inch pie is $10 and an 18-inch is $13, with toppings for $2 each. 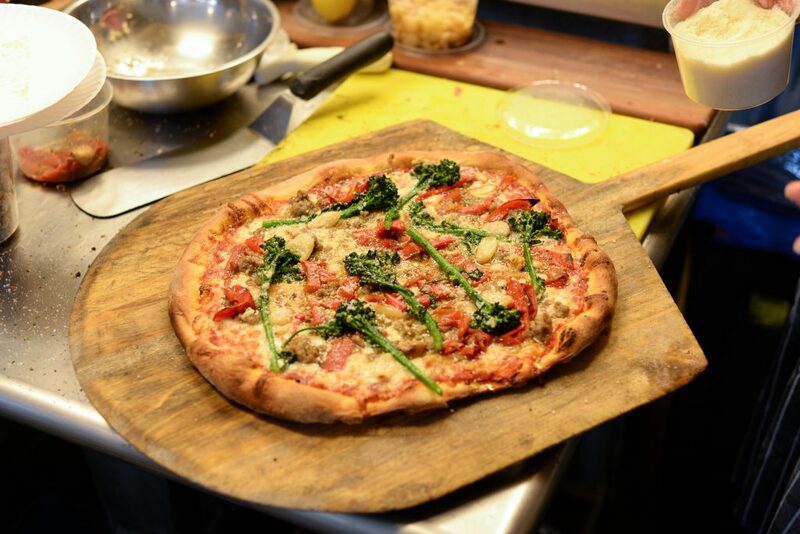 The pizzeria also includes a wide variety of toppings, such as artichokes, broccolini, feta, prosciutto, red onions, spinach, house-made fennel sausage, pepperoncini, roasted peppers, ricotta and walnuts. Myers recognized returning customers, laughing and having conversations with them. One look at Paul & Sons’ menu and one thing is noticeable: the unique combinations of its specialty pies. Some specialty pies include red onion with walnut and gorgonzola, prosciutto with pineapple chutney, roasted pepper with pepperoncini and jalapeño and meatball with green pepper and onion. Instead of garlic knots and chicken wings that are typically offered in other pizzerias around town, they serve sandwiches: roast pork with broccolini and aged provolone, meatball with red sauce and three cheeses and sausage with roasted peppers and Romano. In the future, Myers plans to expand their menu with soups and salads. The restaurant also offers vegetarian and vegan pies upon request. In addition to their specialty pies, Myers crafts a weekly special; something for returning customers to look forward to. Some past specials included a butternut squash pie with pumpkin seeds and goat cheese and roasted cauliflower pie with kale and golden raisins. Not only does Paul & Sons’ creative menu stand out, but the restaurant’s fresh, quality ingredients are what Myers prides the shop on. Everything is made in-house and from scratch every day. Myers said that many of his customers who enjoy his pizza are from New York City, saying that his pizza reminds them of the pies they have had growing up. Paul & Sons is located at 67 ½ Leroy St. The shop is open on Tuesdays through Saturdays from 11 a.m. to 9 p.m., and closed on Sundays and Mondays.